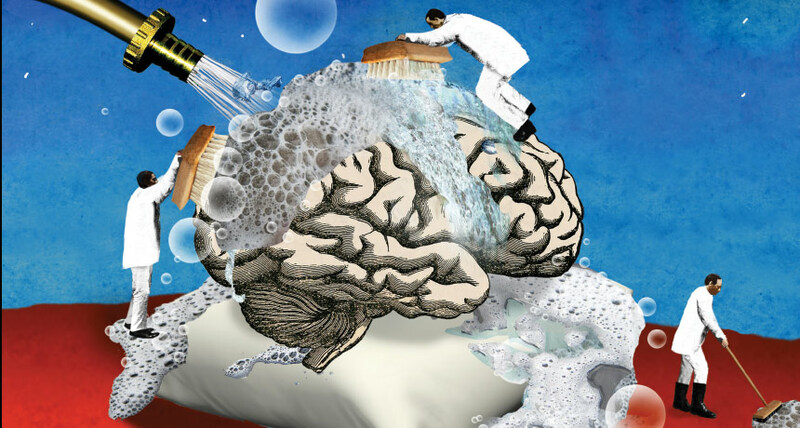 THE CLEAN CYCLE Lack of sleep may contribute to Alzheimer’s disease by robbing the brain of the time it needs to wash away sticky proteins. Neuroscientist Barbara Bendlin studies the brain as Alzheimer’s disease develops. When she goes home, she tries to leave her work in the lab. But one recent research project has crossed into her personal life: She now takes sleep much more seriously. Bendlin works at the University of Wisconsin–Madison, home to the Wisconsin Registry for Alzheimer’s Prevention, a study of more than 1,500 people who were ages 40 to 65 when they signed up. Members of the registry did not have symptoms of dementia when they volunteered, but more than 70 percent had a family history of Alzheimer’s disease. Since 2001, participants have been tested regularly for memory loss and other signs of the disease, such as the presence of amyloid-beta, a protein fragment that can clump into sticky plaques in the brain. Those plaques are a hallmark of Alzheimer’s, the most common form of dementia. Each person also fills out lengthy questionnaires about their lives in the hopes that one day the information will offer clues to the disease. Among the inquiries: How tired are you? Some answers to the sleep questions have been eye-opening. Bendlin and her colleagues identified 98 people from the registry who recorded their sleep quality and had brain scans. Those who slept badly — measured by such things as being tired during the day — tended to have more A-beta plaques visible on brain imaging, the researchers reported in 2015 in Neurobiology of Aging. In a different subgroup of 101 people willing to have a spinal tap, poor sleep was associated with biological markers of Alzheimer’s in the spinal fluid, Bendlin’s team reported last year in Neurology. The markers included some related to A-beta plaques, as well as inflammation and the protein tau, which appears in higher levels in the brains of people with Alzheimer’s. Bendlin’s studies are part of a modest but growing body of research suggesting that a sleep-deprived brain might be more vulnerable to Alzheimer’s disease. In animal studies, levels of plaque-forming A-beta plummet during sleep. Other research suggests that a snoozing brain runs the “clean cycle” to remove the day’s metabolic debris — notably A-beta — an action that might protect against the disease. Even one sleepless night appears to leave behind an excess of the troublesome protein fragment (SN Online: 7/10/17).